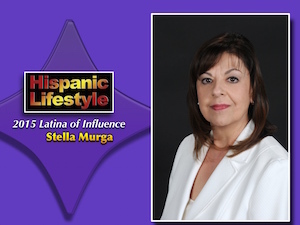 Stella Murga is a 2015 Latina of Influence named by Hispanic Lifestyle. Stella is being recognized for her passion and vision to create programs that have inspire the youth in our community. Hispanic Lifestyle’s 2015 Latinas of Influence will be recognizing Stella and her fellow Latinas of Influence during a luncheon held in their honor on at Latina Conference 2015. Stella Murga is the founder and executive director of the Adelante Youth Alliance (AYA), a community-based, non-profit organization, established in 2001 to prepare youth for college and careers. Under Stella’s direction, AYA produces two annual college and career conferences, Adelante Mujer Latina and Adelante Young Men, focused on inspiring girls and boys to dream big, achieve higher education and career goals. Both have become the largest conferences of their kind in the State of California. First generation, Mexican-American, Stella was born and raised in Boyle Heights, Los Angeles. By the age of 19, she was married to her high school sweetheart and had her first of two children. Stella’s career began as a clerk-typist with the California’s Department of Rehabilitation. She worked her way up the Career Ladder Program – to become a bilingual, vocational rehabilitation counselor, while attending college at night. Stella left State employment to start her own consulting business, assisting disabled adults to retrain and return to suitable employment. The ‘L.A. Riots’, and the alarming increase in local youth violence in the early 1990’s, moved Stella to get involved in her community and volunteer her college and career counseling skills to at-risk youth. Pasadena’s Mayor appointed Stella to the Human Services Commission, where the lack of youth programs led her to establish her non-profit organization. Stella found her second calling, and has since dedicated her life’s work to positive youth development. Along the way, Stella earned her Bachelor of Science Degree in Business and Management from the University of Redlands. She later returned to school to hone her non-profit administrative skills and earned her Master of Science Degree in Public Administration from California State University, Los Angeles. In 2013, Stella was selected by Business Life Magazine, as one of Los Angeles County ‘Women Achievers’. In 2006, Stella was selected by the Pasadena Weekly as one of eight Pasadena/Altadena individuals “making a difference in the lives of teens”. Stella ‘s greatest source of pride, however, is her 45 year marriage, her two children, Eric and Melissa, and three grandchildren, Sofia, Paloma and Vanessa.